Cherry blossoms have always been a perennial favourite for anyone going to Japan in the spring. Apart from famous spots in the Land of the Rising Sun, we bring you some of our favourite places around the world–you know, those that are less crowded or those that let you relax in the sanctuary of nature. While Vancouver may be an unlikely place to view cherry blossoms, we’ll have you know that Japan gave this state over 37,000 cherry trees to beautify this city. 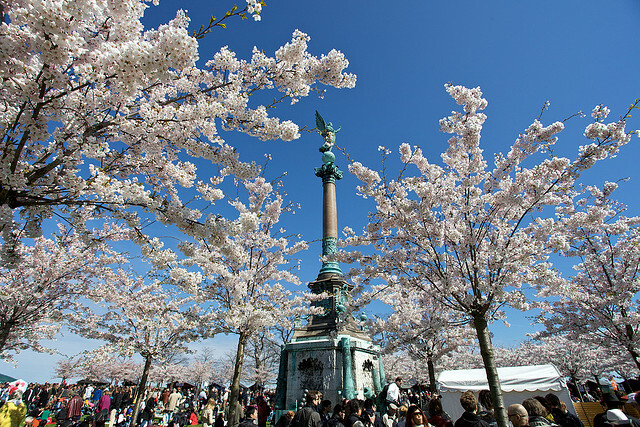 This year, their Cherry Blossom Festival will be held from 2 – 29 April. 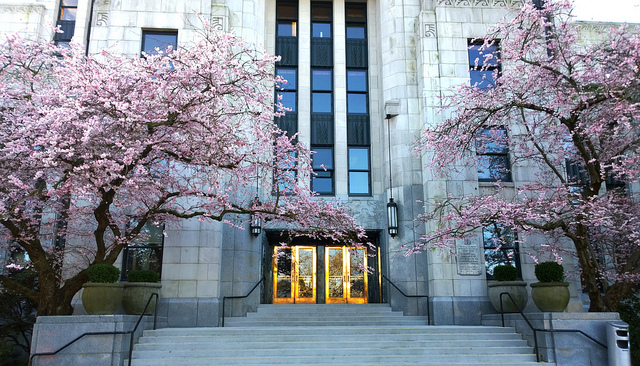 Although these flowers can be seen everywhere, we recommend Queen Elizabeth Park and Stanley Park. How to get there: Alight at the King Edward and Oakridge-41st stations on the Canada Line to get to Queen Elizabeth Park, and take bus #19 to Stanley Park Drive and Pipeline Road to get to Stanley Park. When to go: These cherry blossoms came in early this year–now’s the time to go! 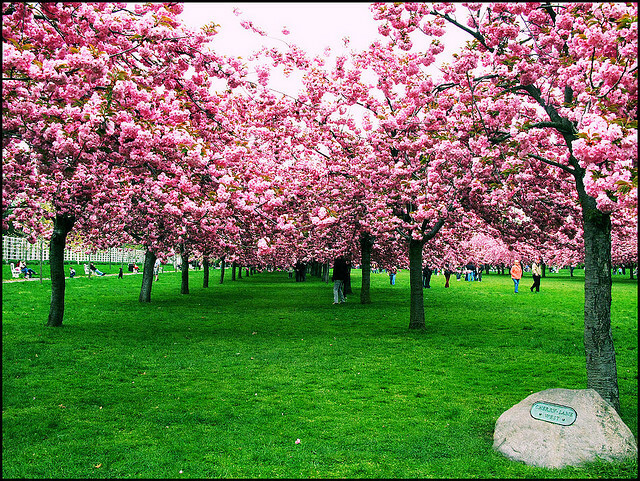 New York City’s very own Brooklyn Botanic Garden has 42 different types of cherry trees, and they have the most variety of cherry blossoms outside Japan, for real. This year, the Sakura Matsuri Festival will be held from 25-26 April. How to get there: NYC’s subway is your friend. There are many ways to get there, but you may take the 2 or 3 to Eastern Parkway and get off at Brooklyn Museum station. Another route would be to take the B or Q to Prospect Park station. 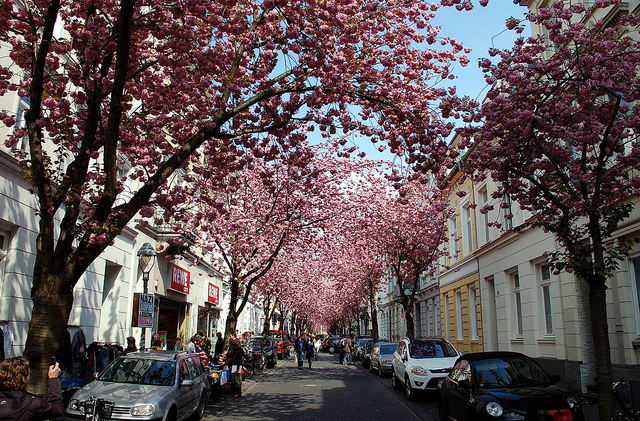 Bonn has a “cherry blossom avenue” that lets people traipse through an explosion of colour. This particular street is called Heerstraße in the city’s trendy Nordstadt quarter. Its flowers were planted there in the 1980s. They last for two to three weeks. How to get there: It’s a five-minute walk from Beethoven’s house. Take the trams and buses to Bertha-von-Suttner-Platz and walk from there. When to go: Although it is not confirmed, it seems like most people are betting on the blossoms arriving mid-April. Copenhagen’s 200 trees were donated by Hiroshima in 2005 to celebrate Hans Christian Anderson’s 200th birthday. They blossom around the Little Mermaid statue in Langelinie Park. How to get there: Take a bus to the Østerport Station and walk there. It takes five minutes. Follow the signs Langelinie and ‘Den Lille Havfrue’ to the left. When to go: During 25 and 26 April when the Cherry Blossom festival is in full swing. Each year, 1,700 of these flowers line the tidal basin of USA’s capital. 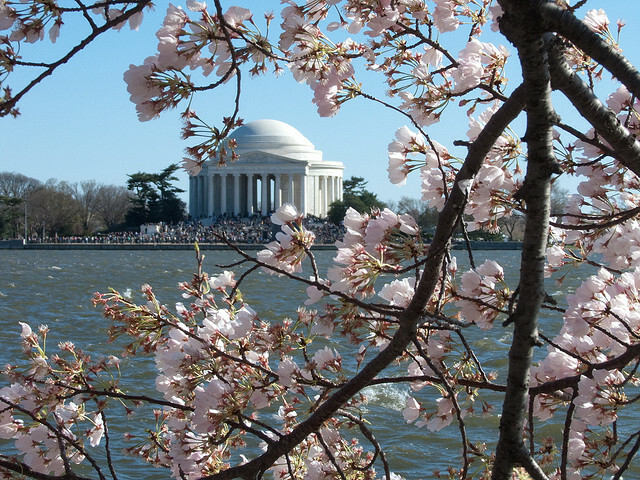 You can check out the state’s cool monuments and participate in this year’s National Cherry Blossom Festival, which ends on 11 April. How to get there:Alight at the Smithsonian subway station, which is on the orange and blue lines. When to go: The blossoms will appear from either 9-13 April or 11-14 April, close to the end of the festival.